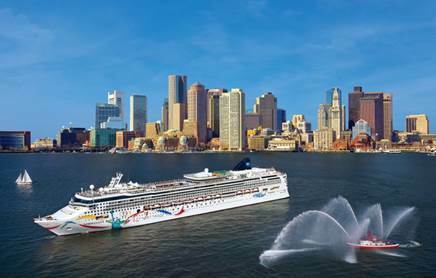 BOSTON, MA (June 17, 2016) – Norwegian Cruise Line’s Norwegian Dawn sailed into her seasonal homeport of Boston this morning as an essentially new vessel, following a month-long dry dock where she received enhancements to every part of the onboard experience, from two brand new restaurants and three new bars and lounges, updated design and décor in all public spaces, to a refurbishment of all staterooms including a complete makeover of the ship’s signature Garden Villas, some of the largest suites at sea. Norwegian Dawn’s extensive renovation is a part of The Norwegian Edge™ program, a $400 million investment that sets a new standard of excellence for the Norwegian brand, encompassing the entire guest experience. Norwegian Dawn’s guests will have several new restaurants, bars and lounges to enjoy after the ship’s refurbishment. A new concept for the Norwegian fleet, Los Lobos Cantina is an upscale Mexican restaurant that offers a modern take on traditional favorites like guacamole prepared tableside, al pastor tacos, enchiladas de mole and hand crafted margaritas, all available à la carte. Los Lobos Cantina will open on July 1. A guest favorite,O’Sheehan’s Bar & Grill is making its debut on Norwegian Dawn today, and features signature sports bar décor while offering favorite pub fare and beers on tap. Wine lovers now have a chance to sip and savor their favorite vintages at The Cellars, a Michael Mondavi Family Wine Bar as the former Pearly King Pub has been completely transformed into a modern, upscale wine bar offering tastings and engaging educational events. Sugarcane Mojito Bar will serve up more than 15 varieties of mojitos in a modern lounge area on Deck 13 adjacent to the new location for Moderno Churrascaria. Finally, Spinnaker Lounge was transformed into the Bliss Lounge, offering a larger space for guests to relax and enjoy a cocktail, with refinished bar fronts, new contemporary accents, furniture and carpeting. The dining experience onboard Norwegian Dawn will be further enhanced with extensive renovations to all of the existing complimentary dining venues. The Venetian and Aqua both feature a completely new look, with enhancements including new wall coverings, carpet and hardwood flooring, entry signage, artwork, ceiling finishes, reupholstered furniture, lighting, and window treatments. Bamboo Asian Restaurant also has undergone a complete refurbishment with fresh carpet and hardwood flooring, new furniture including tables, barstools and chairs, updated artwork throughout the space, new decorative and architectural lighting, along with window treatments and wall finishes. The Garden Café has undergone a redesign with new layout for smoother service that features upgraded flooring, artwork, decorative lighting, wall finishes, signage and furniture. Specialty restaurants will also have a new upscale look and feel throughout the ship. Le Bistro and La Cucina have exchanged locations, with each space presenting a premium dining experience that is brought to life with new décor including updated carpet, furniture, decorative lighting and signage. Moderno Churrascariaresides in a new location on Deck 13 adjacent to Sugarcane Mojito Bar and features all new décor, furniture, window treatments, wall coverings and artwork that evokes the restaurant’s Brazilian theme. Teppanyaki restaurant was completely renovated and doubled in size with two additional tables, new flooring and décor and the addition of a divider between Bamboo and Teppanyaki for a more private experience. Cagney’s Steakhouse showcases a modern look with new décor, furniture, updated artwork, new carpet, wall finishes, decorative lighting and modified, more open layout where guests can enjoy Certified Angus Beef® steaks and those delectable truffle fries. The ship’s existing bars and lounges will also offer a fresh experience, with Gatsby’s Champagne Bar debuting with brand new furniture, flooring, decorative lighting, artwork, window treatments and an art deco-inspired chandelier. The Cigar Bar will feature new tile flooring, draperies, furniture, plus an enhanced new humidor. Every stateroom on the ship was enhanced during this renovation, receiving new carpets, bedding, drapery, artwork, flat screen TVs and furniture. The dry dock also allowed for a complete makeover of the ship’s two Garden Villas, now featuring a more clean and modern look with brand new flooring and furniture inside and out, new ceilings, lighting, bedding, décor and 42” flat screen TVs. The ship’s Atrium features a new modern and clean look with plush carpet and new lighting, chic furniture and a new lounge seating area, as well as enhancements to the Guest Services reception desks. Tides, a brand new shopping venue offering a wide selection of fine jewelry, was added to the Atrium. The ship’s existing shopping venue Ports O’Call has been renamed Tradewinds and also received a complete makeover with new finishes, lighting and flooring, as did the ship’sLibrary. The ship’s pool deck was completely refurbished to create a brighter and livelier atmosphere for sun-seekers with new decking and new white awnings to give the open deck a sleek, yacht-like feel. Additionally, the main pool deck received new exterior showers, upgraded pool loungers, and a fresh look to all exterior corridors. The Bimini Bar overlooking the main pool deck was completely refurbished and now features a completely new design and look. Kids and kids at heart sailing aboard Norwegian Dawn can now enjoy an upgraded Entourage teen space and video arcade with built-in entertainment areas, new carpeting and wall finishes and new modern furniture. Guests looking to unwind after enjoying all that the new Norwegian Dawn has to offer can do so in the completely redesigned Mandara Spa and Pulse Fitness Center, offering state-of-the-art Techno Gym equipment. The Mandara Spa received a new look and layout-- elevating the spa experience with refreshed sleek décor, updated treatment rooms and newly added spaces including a barber shop, nail salon, spa pool and eight heated loungers in the luxurious thermal suite. Norwegian Dawn will sail from Boston to Bermuda each week through October, spending three nights in port, and from New Orleans to the Western Caribbean -- including a call at Harvest Caye, Belize, the Caribbean’s premier resort-style port of call -- during the winter season, beginning in November. For more information or to book a cruise aboard the new Norwegian Dawn, contact a travel professional, call Norwegian at 888-NCL-CRUISE (625-2784), or visit www.ncl.com. For further information on Norwegian Cruise Line visit www.ncl.com; contact us in the U.S. and Canada at 888-NCL-CRUISE (625-2784); or follow us on the following social channels for the latest company news & exclusive content: Facebook, Instagram and Youtube: @NorwegianCruiseLine; Twitter, Periscope and Snapchat: @CruiseNorwegian; and WeChat: @gonclcn. High resolution, downloadable images are available at www.ncl.com/pressroom.